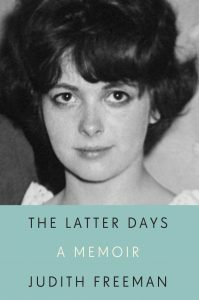 AN ARRESTING, LYRICAL MEMOIR about the path the author took-sometimes unwittingly out of her Mormon upbringing and through a thicket of profound difficulties to become a writer. At twenty-two, Judith Freeman was working in the Mormon church-owned department store in the Utah town where she'd grown up. In the process of divorcing the man she had married at seventeen, she was living in her parents' house with her four-year old son, who had already endured two heart surgeries. She had abandoned Mormonism, the faith into which she had been born, and she was having an affair with her son's surgeon, a married man with three children of his own. It was at this fraught moment that she decided to become a writer. In this moving memoir, Freeman explores the circumstances and choices that informed her course, and those that allowed her to find a way forward. Writing with remarkable candor and insight, she gives us an illuminating, singular portrait of resilience and forgiveness, of memory and hindsight, and of the ways in which we come to identify our truest selves. "The Latter Days, written with thoughtful, hard-won honesty, is the record of a girl growing up in a closed society rigidly governed by a male religious hierarchy-a profoundly undemocratic system that claims to embody American values. Painfully but with no rancor, Freeman makes vivid the security of belonging and the rewards of obedience, the costs of security and obedience, and the rewards and costs of seeking freedom. A brave and valuable book." "This moving book came at me like a secret lost letter from a friend, offering-in Judith Freeman's trademark frank and pellucid prose-a rich and revealing personal history of the world she knows as well as anyone: Utah, in this case the patriarchal cloister of Utah in the 1950s and 1960s. Her story is one of family succor and sorrow, and the flickering origins of shame. This is an affecting and tender memoir, as Freeman displays the dark wonder of the forces that shape our life choices." "A poignant, searching memoir of self-discovery." Listen to podcast interview with Lindsay Park on the Feminist Mormon Housewives Podcast, June 7, 2016 - (length 55 minutes) below.